While Syracuse is best known for being home to Syracuse University and the Erie Canal, the historic community is also a great place for family vacations. Hussain al Nowais is a Syracuse University alumnus who loves going back to visit Syracuse with his family. Here are some of the exciting family-friendly activities you can explore on your next trip to Syracuse. Laser Tag – Laser tag is a fun activity the whole family can enjoy. The Fun Warehouse in Syracuse has a large laser tag arena and arcade. Another popular place for laser tag is The Fun Junction, which is located near the university. This fun center has a laser tag arena, arcade and mini bowling alley. The Museum of Science and Technology – Syracuse has several great museums, such as the Museum of Science and Technology. Kids can enjoy hands-on and interactive exhibits, as well as watch informative and entertaining films at the IMAX theatre. Everson Museum of Art – While the adults explore the fine art collections, kids can enjoy the kid-friendly Art Zone. Here kids can create their own artwork while learning more about the museum’s art collections. Rosamond Gifford Zoo at Burnet Park – This zoo is home to over 900 animals, ranging from insects to elephants. At the zoo families can watch penguins, red wolves and African lions. Critz Farms – Located just outside Syracuse in Cazenovia is Critz Farm, which received the New York State Agritourism Business of the Year Award for its outstanding facilities. The farm offers many seasonal activities, including pumpkin and apple picking and hayrides. 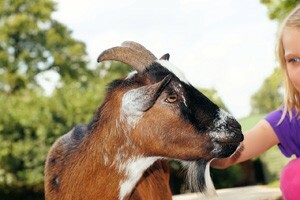 Kids can pet over 25 animals in the petting zoo and run around the on-site playground.